Commercial property investor Ace Liberty and Stone (ALSP) has launched an open offer of convertible notes and warrants to raise up to £4.85m. The conversion price is 25p a share, while the warrants are exercisable at 80p a share. The closing date is 22 January.There are already commitments for £3.01m. Additional cash is required to make more property purchases. Good Energy (GOOD) chairman John Maltby has invested £100,000 in the renewable energy supplier. He acquired 58,000 shares at 173p a share. In the six months to September 2017, Via Developments (VIA1) increased its operating income from £309,000 to £557,000 but still made a small loss. There were net liabilities at the end of the period. Positive Healthcare (DOC) made a maiden profit of £64,000 on revenues of £4.67m in the six months to September 2017. The year end is being changed to March. The healthcare staffing business continues to control costs. Technology company incubator Milamber Ventures (MLVP) reported an increase in interim loss from £196,000 to £263,000. Milamber has launched the Milamber Education Technology Fund and has completed the acquisition of healthcare training company Essential Learning. The education sector will be increasingly important to Milamber. Hot Rocks Investments (HRIP) reported a decline in NAV from £901,000 to £853,000 in the year to September 2017. Hot Rocks has 14 investments in oil and gas, mining and pharma companies. Stanley Gibbons (SGI) put out its interim results just before the end of the year, thereby avoiding suspension. In the six months to September 2017, revenues fell from £17.3m to £16.6m, while the loss fell from £6.36m to £3.09m. The stamps business continues to lose money and the profit from coins was lower. Avanti Communications (AVN) was another company bringing out results just days before trading in shares would have been suspended. The satellite communications operator’s revenues fell from $82.8m to $56.6m. There was net debt of $562m at the end of September 2017, which was before the refinancing plans. David Williams will step down as chief executive after March. Telit Communications (TCM) says that its main bank has granted a waiver for breach of covenants at the end of 2017. Parallel Media has completed the acquisitions of Brick Live and Parallel Live for £10m and changed its name to Live Company Group (LVCG). The previous businesses have been sold. There was £1.26m raised at 30p a share and £2.03m of debt was capitalised. A net gain on its investment portfolio enabled Legendary Investments (LEG) to report an interim pre-tax profit of £248,000. The gain was on the stake in business services software supplier Virtual Stock Holdings. There was a net cash outflow from operations of £28,000. The NAV was £5.22m at the end of September 2017. Clear Leisure (CLP) is injecting its 4.53% stake in 3D mapping company Geosim Systems Ltd into a new subsidiary company that will also be launching a joint venture called Miner One to develop bitcoin mining blockchain data centre. Clear Leisure will invest €200,000, lent by Eufingest, a 10% plus shareholder in Clear Leisure, for 50% of the joint venture. The new subsidiary will be used to acquire other IT business and could eventually be spun-off in order to gain its own quotation. Thor Mining (THR) has appointed exploration manager Richard Bradley to the board. The definitive feasibility study for the Molyhil tungsten/molybdenum project should be finalised in the first quarter of 2018. A mineral resource estimate is expected for the Kapunda copper project is due early in the year. Clean water technology company HaloSource (HAL) says that the Chinese government has halted production facilities in the region that supplies its glass pitchers so fulfilment of orders for JiuBan will be delayed. This means that 2017 revenues will be up to $3m and the loss will be up to $5.5m. There should be revenues of at least $840,000 from JiuBan in 2018. Alliance Pharma (APH) has completed the purchase of Vamousse from TyraTech Inc (TYR) for an initial $13m plus additional payments of up to $4.5m. The human head lice treatment has been developed by TyraTech and it has built up Vamousse as an international brand. The deal is earnings enhancing for Alliance and provides TyraTech with the cash to develop animal health products. TyraTech launched a tender offer of up to $8.5m. The tender offer price is 3p a share. Alliance will be able to distribute Vamousse through its existing European and international partners. Kestrel Partners is building up a shareholding in STM Group (STM) and just before Christmas it took its stake to 3.72%. Oil re-refiner HydroDec Group (HYR) has extended the repayment date of three facilities to the end of 2018 and one of them has been increased by £500,000. The facilities are provided by director Andrew Black. Oracle Power (ORCP) has raised £621,000 at 2.3p a share and broker Brandon Hill has exercised warrants at 0.65p each, which raised £150,000. Silence Therapeutics (SLN) has sold further shares in Arrowhead Pharmaceuticals, taking the total sale proceeds to £17.2m ($23m). The total cost of the Arrowhead stake was £9.2m ($11.3m) and Silence still owns 472,509 shares. TechFinancials Inc (TECH) will invest $200,000 for a fully diluted 2% stake in Cedex Holdings, a Blockchain-based diamonds exchange. There is also an option to acquire a further 90%, fully diluted, stake at an exercise price of $40,000. These stakes could be diluted by other share issues. Copper and gold producer Rambler Metals and Minerals (RMM) has amended its offtake agreement with Transamine Trading, which is making a $4m advanced payment in return for a right of first refusal on any offtake agreement for five years from January 2022. The advance payment plus interest is repayable over 18 months. The phase II expansion is nearly complete and this will extend the mine life by 20 years. EQTEC (EQT) has completed the acquisition of Eqtec Iberia for £14m in shares just over five months after it was announced. The acquisition owns the EGT gasification technology. EQTEC also raised £1.6m at 0.65p a share. China New Energy Ltd (CNEL) is holding general meeting on 17 January In order to gain permission to buy back up to 20% of the shares in issue. This could benefit the share price, which currently has a modest rating given the profitability of the business. New Trend Lifestyle Group (NTLG) is selling its remaining China-focused business for £100 and concentrating on Singapore. The Feng Shui business continues to trade poorly and is seeking acquisitions in Asia. Xeros Technology (XSG) has completed its £25m placing at 225p a share. The polymer technologies developer will use the cash to further develop cleaning, tanning and textile technologies. Gresham House (GHE) is selling its Newton-le-Willows property for £2.1m. The completion of the sale of legacy assets will have raised more than £18m. Gresham House should qualify for IHT exemption. Summit Therapeutics (SUMM) is acquiring Discuva, which is a developer of antibiotics using a bacterial genetics based platform. Summit is paying £5m in cash and £5m in shares for Discuva but no employees will be taken on. Summit will still have enough cash to last it until the end of 2018. Aquatic Foods Group (AFG) has been unable to publish its accounts and it has lost its AIM quotation. URU Metals Ltd (URU) had £1.84m in cash at the end of September 2017. The first drill results for the Zebediela nickel and copper project in South Africa have been published and the drill results for the most recent three holes are due in January. URU also has a 9.7% stake in AIM-quoted Management Resource Solutions (MRS). Draper Esprit (GROW) has made a gain of £7.2m on its stake in Clavis Insights, having originally invested £8.1m in December 2016. This gain will add 3p a share to NAV. Clavis, which is an e-commerce data analyser, was acquired by Ascential for $119m. Windar Photonics (WPHO) has received a new order from its Chinese distribution partner for five WindVision LiDAR systems. Windar has already delivered 50 systems. World Trade Systems (WTS) has reached agreement with Germany-based Naturemed and related companies about the commercialisation of its personal hygiene and healthcare products and it will also help to obtain Chinese registration for them. WTS has signed a five year lease on a London office. Shares in WTS are still suspended. Over the top video streaming business Falcon Media House (FAL) made initial revenues of £232,000 in the six months to September 2017. The interim loss was £2.71m. Since then, £3.4m has been raised from a convertible loan note issue. Rockpool Acquisitions (ROC) still has nearly £385,000 in the bank. Negotiations are continuing concerning the possible acquisition of Greenview Gas Ltd.
Good Energy (GOOD) received applications for £16.7m of the corporate bonds on offer. The maximum application level was £20m. The energy supplier will issue the bonds on 30 June. At the company’s AGM, Martin Edwards was not re-elected as a non-executive director and four special resolutions, three relating to pre-emption rights and one about calling a general meeting at 14 days notice, were not passed. Edwards has been a director of Good Energy since its formation and has expertise in renewable energy generation. It is unclear whether the length of his time on the board was held against him by institutions or whether there was another reason for him being removed from the board. He was chairman of the remuneration committee. South Africa-based social impact investment company Inqo Investments Ltd (INQO) says that occupancy rates of its core investment Kazuko Lodge are improving and it moved into profit last year. The weakness of the Rand has helped to boost tourist demand and room rates. In the year to February 2017, Inqo revenues increased from R10.7m to R17m and a loss of R4.72m was turned into a pre-tax profit of R10.3m, thanks to a rise in other income from R867,000 to R14m. Net cash was R2.3m at the end of February 2017. This year, the first revenues from Bee Sweet Honey and retirement savings scheme provider Four One Financial Services are anticipated. Housebuilder St Mark Homes (SMAP) is paying an interim dividend of 5.5p a share. The shares go ex-dividend on 6 July. Phoenix UK has bought out a rival shareholder in Hornby (HRN) and this has triggered a mandatory bid at the purchase price of 32.375p a share. This purchase took Phoenix’s stake in Hornby to 55.2%. The bid values Hornby at £27.4m. Neither Hornby’s management nor Phoenix wants to lose the AIM quotation. The bid closes on 14 July. Wynnstay (WYN) reported flat interim pre-tax profit of £4.07m prior to the goodwill write-down on the Just for Pets retail business. Pet retailing is a competitive market and it is consolidation. Just for Pets is relatively small and it loss has masked an improvement in the core agricultural division and the Wynnstay Sores retail business. A recovery in the milk price means that farmers are back in profit and are spending more money on feed. Net debt was £8.28m at the end of April 2017, which is higher than last time because of the rise in commodity prices. The interim dividend was increased by 5% to 4.2p a share. The full year profit is forecast to decline from £7.4m to £7.1m. NWF (NWF) also benefited from a recovery in feed demand in the second half of the year to May 2017, although there was a decline in the year as a whole. The food and fuel distribution businesses both made improved contribution. The full year figures will be published on 1 August. South America-focused gold miner Orosur Mining Inc (OMI) says that operating costs were between $800 and $900/ounce last year. In the year to May 2017, Orosur produced 35,371 ounces of gold, which is at the lower end of the expected range. There was net cash of $2.9m at the end of May 2017 even though a new underground mine has been developed. Orosur plans to commence a drilling programme in Colombia, while the deadline for a decision by Asset Chile on whether to back phase II of the Anillo project has been extended to the end of 2017, although Orosur can talk to other potential backers. Timber importer James Latham (LTHM) reported better than expected full year figures. In the year to March 2017, revenues were 7% ahead at £199m and gross margins improved. Earnings per share were 4% higher at 55.8p and the total dividend is 15.35p a share, up from 14.3p a share. Net cash was more than £16m. Revenues were 3% higher in the first two months of the current financial year. InterQuest Group (ITQ) continues to advise against acceptance of the bid from Chisbridge, which is a management backed takeover vehicle. Acceptances of the 42p a share cash bid have been received from shareholders owning 2.85% of InterQuest, which is added to the 40.5% of the share capital that already backed the bid. The offer has been extended to 13 July. European Wealth Group (EWG) is raising £6.14m at 12.8p a share and could raise up to £3.07m more via an open offer to existing shareholders. The cash will be used to pay off debt and deferred consideration. Tracking and security equipment developer Starcom (STAR) has raised £650,000 at 1.5p a share, with each share coming with one-fifth of a warrant exercisable at 2.5p a share for up to 12 months. Some of the cash will be used to pay $246,000 to YA II, which will reduce the drawn down convertible loan facility from $330,000 to $110,000. YA II has agreed to a conversion price for the rest of the facility of 2.5p a share up until the end of 2017. Redx Pharma (REDX) has a chance of securing the funds it requires in order to come out of administration. Discussions are still at an early stage. It is unclear whether this will involve changes to management, given that the current management believed that it could string along Liverpool City Council and put off repayment of its loan. Redx has gained UK Medicines and Healthcare Products Regulatory Agency approval for oral cancer treatment RXC004. This provides permission for a phase Ib/IIa study for gastric, biliary and pancreatic cancer patients. Clontarf Energy (CLON) is in talks to secure further projects and additional finance. Clontarf was recently awarded block 18, offshore Equatorial Guinea. Myanmar International Ltd (MIL) raised a total of $7.3m via PrimaryBid.com and institutions, having initially wanted to raise between $3m and $5m. The Myanmar-focused investment company offered shares at $1.18 each – a 9.2% discount to the market price. Myanmar has achieved a broadening of its shareholder base. The enhanced proceeds are still expected to be invested within six months. Digital media content business Brave Bison Group (BBSN) has appointed Claire Hungate, a former chief operating officer of ex-AIM TV production company Shed Media, as chief executive but she does not join the company until September. Brave Bison says that it does not believe a merger with fellow AIM company Zinc Media is in its interests. Water treatment company HaloSource (HAL) has finally completed a £1.8m fundraising at 1.5p a share. The cash will provide working capital to help expand the drinking water business and develop the lead removal technology. The cash will fund the group into 2018. The new shares are more than one-third of the enlarged share capital. The completion of the conditional fundraising was announced on 21 April. There is no mention in the latest announcement of the investor that had tried to gain Chinese government approval to invest. Gold producer and explorer Shanta Gold (SHG) raised £11m at 6p a share as part of a refinancing that also includes a new $50m debt facility to replace the existing $40m facility. Shanta is acquiring TSX Venture Exchange-quoted Helio Gold, which has gold exploration assets near to Shanta’s own licences, for $5.6m in shares. Shanta will be able to finance the commercial underground production phase at its New Luika gold mine. Thor Mining (THR) has raised£460,000 at 0.9p a share and there is one warrant with each new share which is exercisable at 1.8p a share. Thor has agreed to acquire 25% of US Lithium, which has interests in Arizona and New Mexico, from Pembridge Resources for £59,000 and £30,000 will be provided to cover operating costs. There is an option to acquire the other 75% for 52.8 million shares at a deemed price of 0.9p each. Thor has completed a 50 hole drilling programme on the Dundas gold project in Western Australia. The results should come through in a few weeks. First, the good news from TLA Worldwide (TLA). Management is obviously trying to suggest that it does not have contempt for investors by releasing a profit warning at 7am – its advisers must be doing something right. This is certainly a big improvement on publishing a profit warning at 6.26pm on 23 December 2016. TLA still thinks that it will be able to report its 2016 figures and post its accounts on 30 June. However, the trade receivables write-off is going to be higher than the previous guesstimate of $1.5m-$2.5m. The write-off is expected to be $3.2m and on top of that the negative effect of the accounting corrections on EBITDA is likely to be $3.6m, up from $2m previously. That will leave 2016 EBITDA at $4.8m. The interest charge will take up the majority of that figure. It is not just that, though. The original 2015 profit will be reduced by $1.9m. Net debt was $21.8m at the end of 2016 but a large chunk of the receivables that should have helped to reduce that figure are not going to come in. There is no dividend – unsurprisingly. The finance director has left, although he will be providing assistance for three months. Superyacht painting and maintenance services provider GYG (GYG) is raising £6.9m at 100p a share prior to joining AIM on 5 July. GYG is valued at £46.6m at the placing price and the plan is to pay an annual dividend equivalent to 6.4% of the placing price, although it will be 3.2% for 2017. Last year, GYG generated revenues of €54.6m and made EBITDA of €6.7m. China-focused healthcare investor Cathay International Holdings (CTI) says that it will receive just over $4m in dividends from 50.56%-owned subsidiary Lansens Pharmaceutical. The dividend will be paid on 4 August. Lansens’ subsidiaries have received insurance payments totalling $2.58m. Two directors were not re-elected at Cathay’s AGM because, although they received the majority of votes, they did not receive the majority of independent votes. Further re-election resolutions will be proposed in the next four months and they will only need a majority to be passed. Falcon Media House (FAL) has signed a memorandum of understanding with Tata Communications to collaborate on an over the top service for brands and content rights holders, using Falcon’s Q-Flow technology. Musical instruments retailer Gear4Music has gone from strength to strength since joining AIM in June 2015. The share price has risen by 600% in the past year. In May, £4.2m was raised at 690p a share. The musical instruments market remains fragmented but Gear4Music is becoming one of the main players in Europe and it is opening distribution facilities in Europe as well as expanding its UK base. The investment required is holding back short-term profit growth and, in fact, pre-tax profit is expected to dip this year from £2.7m to £2.4m before rising to £3.3m in 2018-19. 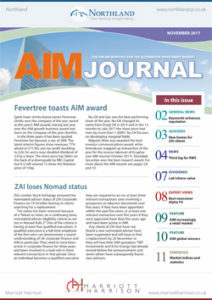 Tissue manufacturer Accrol had just celebrated its first anniversary on AIM when it was given this award. Accrol floated at 100p a share on 10 June 2016 and the share price has risen to 159.5p. Full year figures will be announced on 10 July. Accrol is a leading supplier of tissue products to the discount sector and it has opened a new factory in Leyland, Lancashire. This investment takes annual production capacity to 143,000 tonnes. A ten-year lease has been secured on a 368,000 square foot warehouse in west Lancashire and this will become the central distribution facility. The warehouse management and logistics have been outsourced. English wines producer Chapel Down has been quoted on NEX and it forerunners for more than 14 years. Revenues have grown from £1.47m in the year to September 2002 to £10.2m in 2016. The Tenterden-based business made a small loss when it floated. Continuing operations moved from an underlying pre-tax profit of £156,000 in 2015 to £340,000 in 2016. Frosts have hit production this year but the outcome for wine production is still uncertain. The company has developed brewing business Curious Drinks, which has separately raised money to build a new brewery but Chapel Down still effectively controls the business. The new Ashford brewery will be open in mid-2018 and this will free up space for further wine making at Tenterden. African agricultural and forestry business Obtala is set to start to commercialise its operations this year. Up until now revenues have been modest but they are set to jump to £11.9m in 2017, trebling to £36.9m in 2018, which should be high enough to allow Obtala to make a profit in 2018. Hardman estimates that the Mozambique forestry assets could generate EBITDA of more than £25m in 2021. There are also plans to build up the orchard and horticultural business in Tanzania. In May, Obtala acquired profitable sawn timber trader WoodBois International for $14.8m (£11.4m). The Copenhagen-based business sources timber from across Africa and sells it around the world. WoodBois has been short of capital to finance growth and it fits well with Obtala’s existing timber and forestry operations. Telematics technology provider Quartix is highly cash generative enabling it to finance growth in the UK, France and the US and pay increasing dividends. Chief executive Nick Jarmany founded Quixant in 2005 having spent more than two decades at Densitron Technologies. 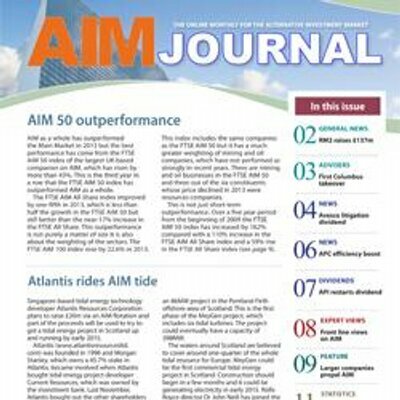 He guided the business to an AIM quotation in 2013. The UK remains the dominant region for revenues but France and the US are growing strongly from low bases. Last year, US revenues more than doubled, from £256,000 to £677,000, but the loss was even higher than that because of the investment in sales and marketing and support services to enable growth over the next five years. Outsourced video games services provider Keywords Studios has made numerous earnings enhancing acquisitions since it joined AIM but this award is for the purchase of Synthesis for up to €18m, which is one of eight purchases in 2016. This deal meant that Keywords became the global leader in localisation and voice-over recording for video games and added additional studios in Germany, France and Taiwan. Keywords is expected to maintain a net cash position at the end of 2017 but this will depend on the level of acquisitions activity. There is a €35m bank facility that is not fully utilised and that could be used for further acquisitions.